Natures Own Essential Women contains 1-3, 1-6 Beta Glucan, vitamin C, zinc and selenium, all of which contribute to the normal function of the immune system and the protection of cells from oxidative stress. Nature`s Own was born in 1979; the main difference between Nature`s Own and other companies is that they sell vitamin and mineral products in a Food State. This means they work in the body like food, which means the body knows how to use them to nourish whichever part of the body is in need. Inactivated lactobacillus bulgaricus combined with: magnesium citrate, para amino benzoic acid, ferrous fumerate, zinc citrate, cupric sulphate, manganese chloride, sodium borate, chromium III chloride, potassium iodide, vitamin D3 and sodium molybdate; beta (1-3, 1-6) glucan (saccharomyces cerevisiae); Vitamin C incorperated in citrus pulp; Vitamin E combined in vegetable oil; beta carotene combined in carrot concentrate; mineral enhanced yeast providing selenium; Vitamin K2 (MK-7); microcrystalline cellulose; sodium CMC, silicon dioxide; pantothenic acid; niacin; thiamin; vitamin B6; riboflavin; folic acid as methylfolate; biotin; methylcobalamin and tablet coating (hydroxypropylmethylcellulose). Take two tablets daily as a food supplement or as directed by a practitioner. 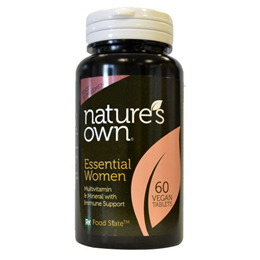 Below are reviews of Natures Own Essential Women - Multi Vitamin - 60 Tablets by bodykind customers. If you have tried this product we'd love to hear what you think so please leave a review.